CADAC 8x4 J Type Submixer #6254. 100% Serviced and ready to go! 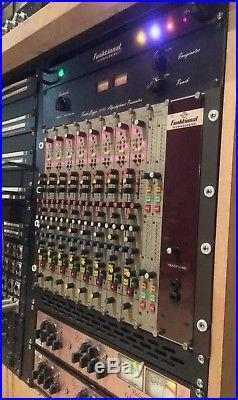 Cadac 8 Channel Input x 4 output Mic Pre / Equalizer / Mixer 8x4 J Type Submixer #6254. 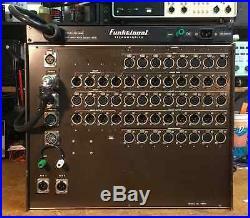 8U Rack Mount Mixer 1U Rack Mount Power Supply. These where designed by CADAC a Clive Green company in the late 1980s made to mate to the J Type large format analog mixing desk. 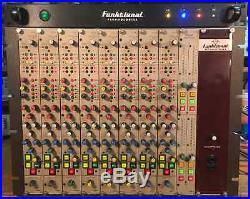 Since these are stand alone Funktional Technologies designed a power supply to CADACs specifications to work independently from the large J desk. This is constructed in heavy weight steel frame. Modules can be easily removed. This CADAC compact submixer has all the warmth & sound weve known to love in a small package. We have a few of these. Hi Gain Mic amplifier Balanced. Lundahl Transformer Direct & Group Outs Balanced. 3 Band sweepable parametric equalizer. 2 Aux Outs w/ transformers Balanced. The Direct Channel Outs are perfect if recording to Protools or any digital interface. The Beautiful Lundahl transformers CADAC Mic Pre & EQ, Get the sound where you want it without adding plug-ins. You cannot get the sound from newly designed audio electronics Mic Pre's and EQ's. Since the advent of SMD (Surface Mount Device) design the rich fidelity is lost! We design analog & digital electronics and have been for many years. International buyers welcome Contact with any questions. The item "Cadac 8 Channel Input x 4 Output Mic Pre / Eq 8x4 J Submixer Lundahl Neve" is in sale since Friday, August 31, 2018. This item is in the category "Musical Instruments & Gear\Pro Audio Equipment\Preamps & Channel Strips". The seller is "lissajou62" and is located in Brooklyn, New York. This item can be shipped to United States.